We like to think you love Getting On Travel. (And we love writing for you!) But we know that you know we’re not the only site devoted to boomer travel. Indeed, many of our wonderful contributors to Getting On Travel have their own great boomer travel blogs. Other colleagues also write about the fun travels mid-lifers and empty nesters can enjoy. Some of these cover both shoestring and luxury travel, others focus on solo travel for boomer women, still others offer tips to help travelers save money while exploring the world. Each blog has its own style and reflects the distinctive personality of the boomer blogger. 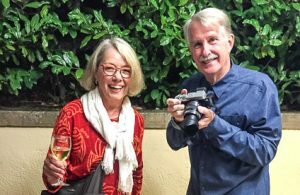 The common bond we share, however, is that we all write for that lovely and growing group of travelers over age 50 (or nudging close to it) – that’s you! So for more great travel inspiration, check out our ultimate list below of some of the best boomer travel blogs you might want to follow in 2018. 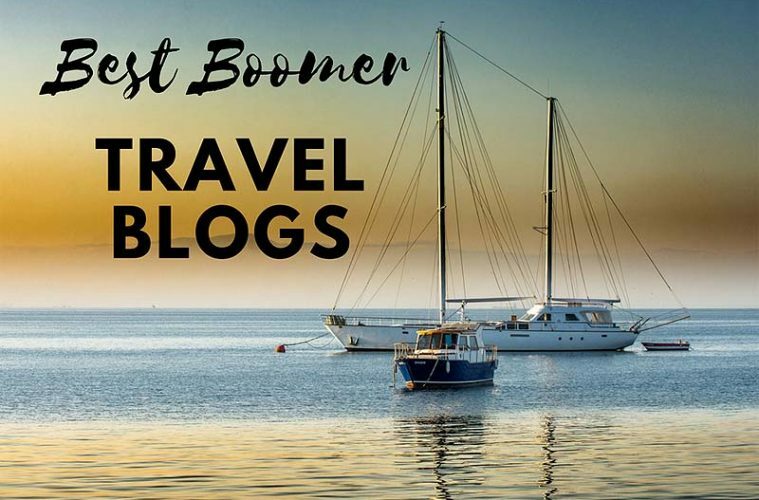 Since we focus on luxury travel, we picked mostly luxury boomer travel blogs (though we’ve included a sprinkling of other boomer travel blogs, simply because they’re so darn good and well-known). That’s us! We share the scoop on luxury boomer travel. Yes, we dish on five-star hotels and sumptuous cruises, but we don’t stop there. We think midlife travelers have reinvented the term “luxury travel” – you want your passions to be shaped by your interests not your age, right? So we cover authentic experiences unspoiled by mass tourism, soft adventure, health and wellness, the boutique and the bespoke. 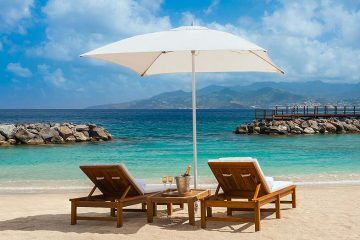 (Check out our hit post “Best All-Inclusive Resorts for Boomers” with some interesting surprises.) We’re mindful of value too. What’s really different about Getting On Travel (GOT) is that we have over 25 authors, each writing about luxury boomer travel from their own unique perspective. Boomers who like it hot are drawn to A Taste for Travel, a hub for travelers who love food, drink and sun destinations. Showcasing the best of Mexico, the Caribbean, and southern Europe and North America, it celebrates seasonal, locally-sourced and traditional cuisines as well as local experiences, resorts and select hotels. The site’s “12 Reasons I’m Tempted to Drop Everything and Move to Grenada” was awarded Best Caribbean Blog Post in 2016 by the Caribbean Tourism Organization (CTO). 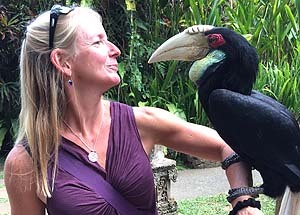 Published by investment banker turned travel writer Michele Peterson (with several contributing writers), the website/blog also includes recipes, travel tips and special discounts. Family dynamics change dramatically when the children have grown up and left the “nest.” Realizing that now is the time to embrace Life 2.0, Suzanne Stavert and her best-friend-and-husband Craig do just that. On Adventures of Empty Nesters, Suzanne writes about their gourmet food trips, the vibrant destinations they visit and the sumptuous digs they bed down in. Her blog promises motivating midlife inspiration – see “My Epic Adventures in Bangkok: Ten Reasons to Visit Thailand in 2018.” You’ll leave with a smile on your face and a pocketful of new travel ideas for how you, too, can celebrate life after kids. “Blonde” (Kay Dougherty) and “Brunette” (Anne Reilly) are baby boomer sisters who have happily transitioned from camping to flying business class on Qatar Airways (“which is a lot more fun”). And they do get up to some fun at Blonde Brunette Travel! They were named one of the “Top 20 Baby Boomer Bloggers Having More Fun Than Millenials” in 2016 by TripAdvisor. Think birding in Florida, eating their way through Italy, cruising and buying (uh oh) ill-fitting boots in Buenos Aires. With almost 200,000 Twitter followers and over 37,000 Instagram fans, these boomer bloggers are rocking it on social media! 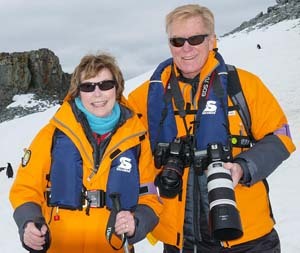 Dennis and Lynn Gagnon have racked up gazillions of frequent flyer miles – they’ve been traveling the world for over 45 years (usually in style). Their blog Bonvoyageurs focuses on luxury escapes, city breaks and cruises for discerning business and leisure travelers of a certain age. Suzanne Fluhr, a “recovering Philadelphia attorney,” writes about baby boomer travels for the body and mind on her Boomeresque blog. She often accompanies her physician-scientist husband on his travels (aka “Mr. Excitement” – meant as a term of endearment). An enthusiast of Zentangle (a meditative art form of drawing structured patterns), she weaves Zentangle into many of her posts. She also is the travel editor of Midlife Boulevard, an online lifestyle magazine for women over 40. So we know boomers are always looking for new adventures. But have you ever been on a chocolate-centric journey of discovery? If you love chocolate and travel, bookmark Chocolatour and start at “Chocolate Travel Explained.” Award-winning author, freelance journalist and blogger Doreen Pendgracs takes you around the world in search of the best chocolate and chocolate experiences. She visits chocolate festivals and attractions, chocolate spas and resorts, and cocoa plantations, and of course, indulges in cocoa cuisine too – and shares her findings and experiences in a casual conversational style. You’ll learn how to taste chocolate like a pro and discover everything the world has to offer in the new niche of chocolate travel. 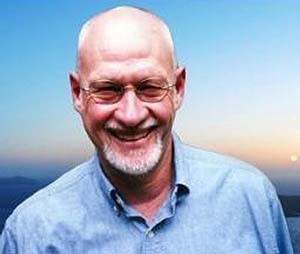 A seasoned journalist, screenwriter and copywriter, Clark has authored many travel guide books and written on such esoteric topics as “yacht piracy” for numerous magazines and newspapers. Along the way, he’s graduated from backpacking around Europe to traveling with his cohort of baby boomers on cruises, adventure trips and holidays with grandkids. On his blog Clark Norton, this “expert in baby boomer travel” shares his insight on everything traveling to Zimbambwe to the lure of theme cruises. We especially like the boomer-relevant guest posts on traveling with cancer or a disability. 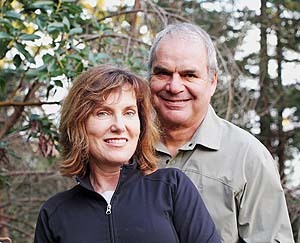 Paula McInerney and Gordon Arthur are full-time travel bloggers from Australia. They’re “a little bit hippy and a little bit rock-and-roll” – and, yes, they’ve written about visiting ABBA The Museum in Stockholm. Paula says they write for fit, free and financially-comfortable baby boomers, but adds, “We can’t be pigeon-holed on our travel style.” Houseboating exploits in Amsterdam. Exploring Mykonos by quad bike. Saigon street food. Find this and more on Contented Traveller. Eye Prefer Paris is an ex-New Yorker’s insider’s guide to Paris. 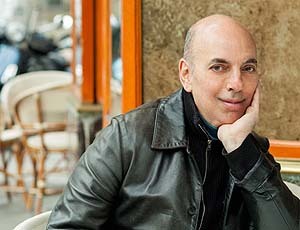 In 2005, Richard Nahem moved to Paris at age 49 to start a new life (see “My Story“). He now writes his blog from his fabulous 18th century apartment in the fashionable Marais district of Paris. Want info on the smash Christian Dior museum exhibition or luxury Left Bank apartments with hotel-like services? Richard’s blog is a goldmine of information on what to see and where to stay and eat in the City of Lights. He also covers other European destinations too. Addicted to France, Janice Chung is a frequent traveler to the country, seeking out and covering experiences that aren’t always written about in travel guides, like these “Unique Paris Experiences.” She’s now visited almost all the regions of France. In 2018, Jan will embark on her 30th trip to France, adding to her growing list of culinary, educational, active and arts/entertainment experiences. 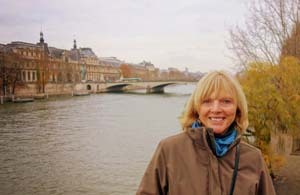 Her advice on experiential travel in France and tips on ways to splurge or save money – found in France Travel Tips – can enhance your trip whether you’re a novice or a repeat boomer visitor to the country. “Go where you have always dreamed of!” is the catchphrase of Golden Age Trips, a blog run by Sheila Berrios, which mainly addresses the need for more travel services targeted to the growing senior population. 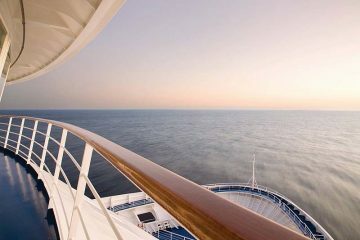 “Superagers” – a term used to refer to active boomers – look further than cruises, she notes (we hear you Sheila! ); they’re “on the hunt for travel experiences that immerse them in the culture and activities of their destination.” Like crocodile spotting. That’s what captivated Sheila and her mother when “Walking Through Myakka River State Park” in Florida. Sheila’s mother is a boomer, and Sheila shares destinations, travel tips, accommodations and day trips that not only she enjoys, but that could be enjoyed by her mother or yours. As a baby boomer with a passion for outdoor adventure, Alison Abbott isn’t afraid to step out of her comfort zone and jump off the occasional cliff. She’s a Boston-based travel writer who focuses on “sustainable shades of green luxury” on her blog, Green With Renvy. Supporting indigenous communities, eating seasonally and protecting nature around the world are all part of the formula. As a responsible traveler with a keen sense of place, Alison seeks out sustainable initiatives wherever she visits. Her moving story on “The Demoiselle Crane Man of India” is about one such connection – illustrating no matter what our age, we can all make a difference. 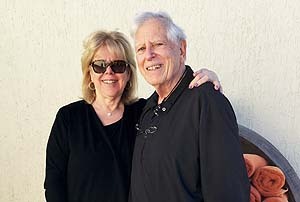 Married on Elvis’ birthday, Veronica and David James are having a blast in the “empty nest” phase of their life. After the youngest of their three children flew the nest for college, they started traveling. And traveling. And never stopped. They now have no nest and are full-time travelers on the go. Totally irreverent, their hugely popular Gypsy Nesters blog is all about having fun when traveling. Stories cover the gamut from “The Hippest Public Bathroom in the USA” to “Accidentally Attending the Alarde Festival” (while trekking the Camino de Santiago). No doubt about it. This is absolutely one of the best boomer travel blogs to rummage through. Working hard. Paying the bills. We all understand that. But Barbara Weibel never really enjoyed her various jobs over the years. “I felt like a hole in the donut… empty on the inside” she explains. So after battling chronic Lyme disease, she strapped on her backpack and traveled alone around the world for six months. And that’s how she started Hole in the Donut. Now she travels, takes photos and writes full-time – loving what she does. Her stories lean toward the cultural, with palaces, monasteries, archaeological sites and the like taking center stage. 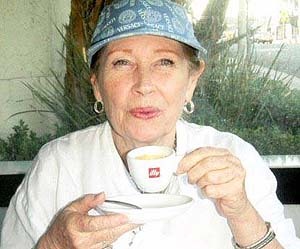 “Life is good” is how it rolls for Bonnie Carroll, a traveling and life-loving grandmother, who chronicles her fine food, wine and travel adventures in destinations throughout the world in her monthly online site Life Bites News, founded in 2005. 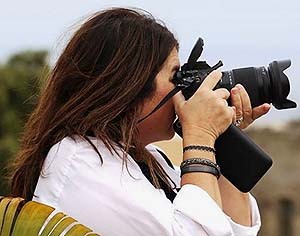 She especially loves covering food-and-wine events, spas and hotel openings in California – see “Avocado Brunch Delights Along the California Coast.” And she’s careful to point out any accessibility issues for those who are less mobile. 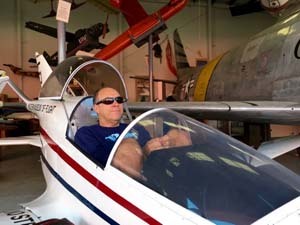 Jonathan Look was an air traffic controller and a “blindly accumulating happy baby boomer.” Then he decided to retire early in 2011 and sold almost everything he owned to pursue a life of adventure, travel, writing and photography. 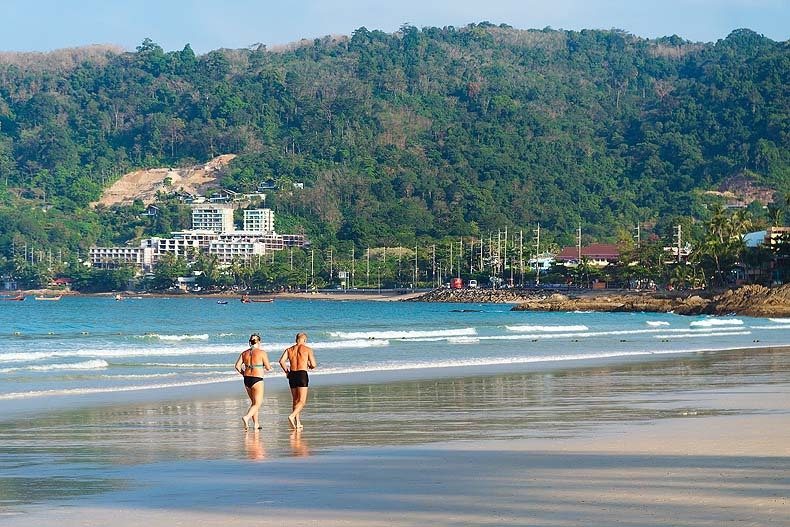 His blog Life Part 2 is about showing fellow baby boomers that the world isn’t a “scary place to avoid.” Like Jonathan, you too can swim with whale sharks in Mexico, walk the Great Wall of China and, depending on how fit you are, run in the London Marathon. (But, Jonathan, we’re going to pass on eating a beating cobra heart in Vietnam!) 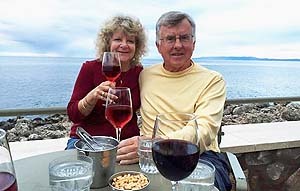 Check his blog’s “Retirement” section for posts on retiring abroad. “Fun doesn’t just happen – you have to make it happen,” says Patti Morrow. She knows how. 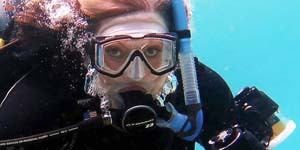 Scuba diving in the Great Barrier Reef. Sky diving in Hawaii. Dog sledding in Oregon. (Sounds like a lot more fun to us than lobbying! Patti was a lobbyist for 10 years.) She admits she’s more of an adrenalin junkie than most boomers, so it’s not surprising that she specializes in boomer adventure travel on Luggage and Lipstick. If you’ve reached your midlife birthday and sighed at least once, “I can’t believe how quickly time has passed,” do yourself a favor and check out More Time to Travel. It provides travel advice, information and inspiration that will get you moving – how about “Easing into the East on a Cruise in China”? Pursuing their own second acts after long careers in public mental health, the evocative writing of psychologist/journalist Irene S. Levine is enriched by the photos of her psychiatrist/husband Jerome. Whether you’re a seasoned traveler or simply an armchair one, join them as they explore new places and savor new tastes. 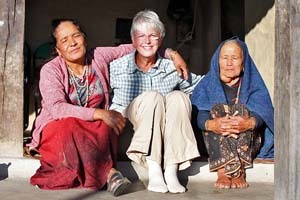 Their blog is guaranteed to lift the spirits of travelers over the age of 50. Donna Hull (the writer) and Alan Hull (the photographer) have been reporting on their active travel adventures on My Itchy Travel Feet since 2008. Says Donna: “Boomers bring energy to their travels. We’re willing to try new activities and embrace new experiences with an open mind.” And they’ve experienced lots! Arctic expedition cruising, Oregon road tripping, iceberg hunting in Greenland, sifting through fossil history – you name it, they’ve done it (or almost). They offer plenty of helpful practical tips too. Donna Meyer writes for “mature women” who’ve “been around for awhile… around the block, around the country, or around the world” and who aren’t done yet. However you want to describe them, “Just don’t call us OLD,” she declares. (Cheers to that!) 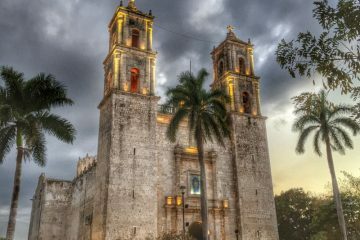 Nomad Women empowers 60ish women to “get up, get out and see all that the world has to offer.” When not traveling, she lives in the fairytale colonial city of San Miguel de Allende, Mexico, where many cultured retirees from Europe and the U.S. also live (obviously, her blog is one to go to for Mexico travel information). 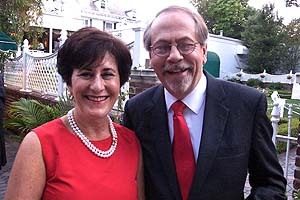 Retired U.S. expats, Anita Oliver and Richard Nash left the career treadmill in 2012 to explore the world. For three years, they traveled full-time but loved Portugal so much they decided to get an apartment and car there. Now “semi-nomads,” they write about life in Lagos, Portugal, as well as their other trips throughout Europe and the U.S. Their blog No Particular Place to Go is full of common-sense tips on how to retire in another country, including money-saving tactics for living abroad. For Betsy and Pete Wuebker, “happiness is found in a simple, travel-centered life.” They were 50-somethings living in Minnesota when they decided to escape the harsh winters and ditch their “ordinary” life to travel full-time. They started Passing Thru in 2008 and now have been “location independent” since 2011. House-sitting has helped to keep their costs to a minimum. Favorite travel activities? Brushing up on history, people-watching and seeking out watering holes and cafes where locals hang out. An Arizona chiropractor who gave up her career five years ago, Cacinda Maloney now works as a full-time luxury travel writer and blogger. And she packs in a lot of miles! She makes it a point to travel every six weeks; in 2016 alone, she traveled to 47 countries. Recent stories on Points and Travel chronicle all-inclusive resorts in the Maldives, Croatia island-hopping, and “vining” and dining in Montana. Don’t expect to find any hiking stories though, she says – cultural tourism and “smart luxury travel” are her specialties. “Luxury travel with a twist of adventure” captures the spirit of the colorful stories on the award-winning Sand In My Suitcase blog. 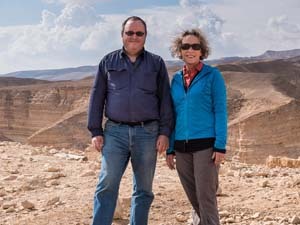 It’s produced by Janice and George Mucalov, lawyers by profession, now writers, whose travel features and photos are published in many North American magazines and newspapers. The couple have a penchant for exploring the exotic – see “How We Almost Fell Off the Earth in Northern Mozambique.” While they sometimes “get a little, er, sandy,” they love knowing there’s always “a soft return” at the end of each day. Honest and refreshingly well-written, their stories and reviews appeal most to active midlife travelers lusting after far-flung destinations. 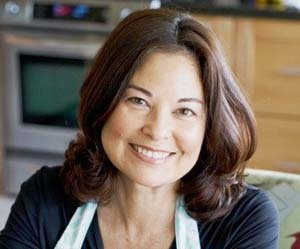 Boomers who like culinary travel will find She’s Cookin | Food and Travel, well, tasty! Priscilla Willis indulges readers with culinary escapades from the simple to the sublime. Think a traditional Belizian picnic lunch, prepared by a local widow, enjoyed among the ancient ruins of Caracol to the opulent Michelin-starred Tosca, soaring 102 stories above Hong Kong’s Victoria Harbor. 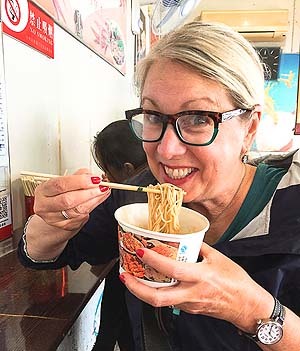 She includes anecdotes on local street food (both palatable and bizarre), food tours (like this “Night Market Tour in Shanghai”), cooking classes and getting outdoors, along with tips on making trips as stress-free as possible. Frank (aka “BBQboy”) and Lissette (aka “Spanky”) are a 50-ish couple who left their home in Montreal, Canada, in 2014 to travel the world. 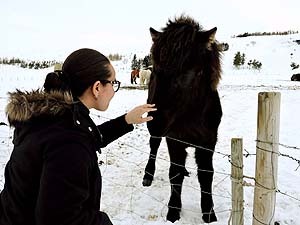 They are slow travelers, often staying in places for two months at a time, which allows them to really connect with locals and get to know the nitty-gritty of their temporary homes. As a result, their posts are long, detailed, thoughtful and insightful; you won’t find any “wishy-washy fluff pieces” on The Travels of BBQBoy and Spanky. Frank takes many beautiful photos too. 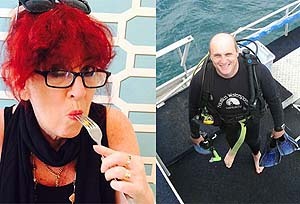 Just two of 4,000,000 baby boomers in Australia, Jane and husband Duncan Dempster-Smith set out in 2014 to travel on the equivalent of the Australian couple pension of $92 a day. On To Travel Too, they show you how to travel the world on less, often by house-sitting. Their mantra: “Age is no barrier when it comes to travel.” It’s certainly no barrier for them – they’ve soared in hot-air balloons, trekked to Machu Picchu and slept in the desert in Jordan. For posts of particular interest to boomers, see the “Baby Boomers” tab at the top of their blog. 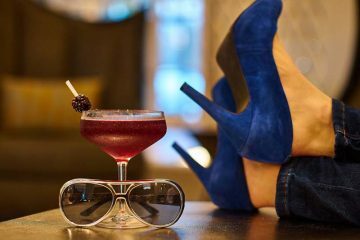 Anda Galffy is an opinionated travel blogger who isn’t afraid to speak her mind on Travel Notes & Beyond (lots of readers have commented on her recent rant on tipping in North America). 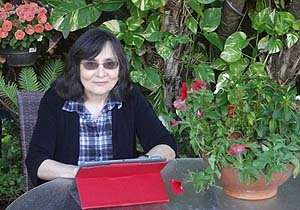 Originally from Romania, Anda has lived in California for over 25 years now. But her heart remains in Europe, where culture and history are at the forefront. Not surprisingly, her stories highlight the cultural aspects of the travel destinations she visits (like what you should know about Hungarians and the mystery of Florence’s cathedral dome). Her photographs are particularly luscious. 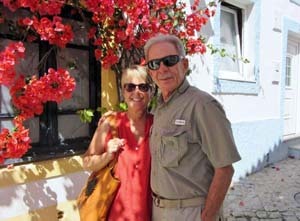 Catherine Sweeney is a “boomer woman traveler” who visits new and familiar destinations with “youthful enthusiasm.” She often travels with her husband (aka “Mr. TWS”); when not gadding about, they make their home in Scottsdale, Arizona. You’ll find lots of great information on everything Arizona on Traveling With Sweeney – from the best Scottsdale hikes to interviews with locals offering insider tips (like spa holidays in the summer at hugely reduced rates). “Value luxury” is Mary Jo Manzanares’ travel ethos – what she calls “luxury for real people” or “that sweet spot where experience and price intersect to create WOW.” Her blog Traveling With MJ is targeted at women in the baby boomer demographic (sorry guys), many of whom are former or working flight attendants (Mary has spread her wings as an attendant in the sky). Her favorite trips are cruises and visits to Italy, where she always ships home a bottle of great Tuscan or Brunello wine. Originally started in 2009 as a blog to keep in touch with family, TravelnWrite now attracts a broad segment of readers from around the world. 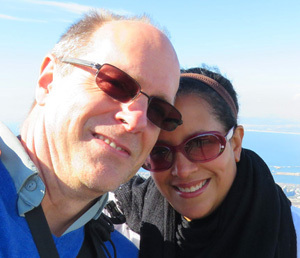 Jackie Smith, a newspaper reporter turned public relations director, and husband Joel, a former attorney, sold their home in Kirkland, Washington, and now live in a “house on the hill” in a small village in Greece. When they’re not traveling, that is. Most recently, they’ve ventured to Egypt. But their heart remains in Greece; be sure to check their blog if Greece fills your travel dreams. Want your travel info in bites that are quick and easy to digest? Travels With Carole uses short descriptions so you can read these snippets in a hurry. 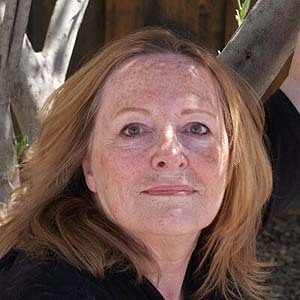 The author of 17 books (and also a master of long-form writing) including “Weekend Adventures in San Francisco & Northern California,” Carole Terwilliger Meyers especially likes kicking around New York City and her home state of California. Boomer bragging rights: She was an extra in Mick Jagger’s “Visions of Paradise” music video. Elizabeth Rose shares the highs and lows of the travel experience. Most of her experiences are “raves” but there are occasional “rants,” which are popular with readers. (We love her rant on “Alaska Airlines: Don’t Put the Can in the Can Again.”) Although she says the rants are often therapeutic for her, they’re also helpful for traveling readers who want to avoid bad travel experiences. 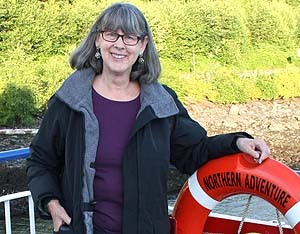 Travel Writer Rants and Raves is the boomer travel blog to check for information on traveling the western half of North America (Elizabeth’s specialty), from Alaska to Mexico. 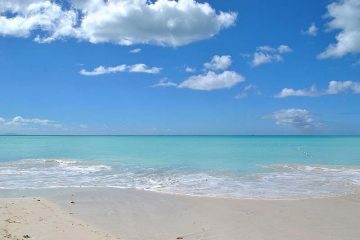 “Sun, sand, sea and me” is what Debbra Dunning Brouillette covers on Tropical Travel Girl. A boomer writer who grew up in Indiana, she fell in love with tropical destinations early on. 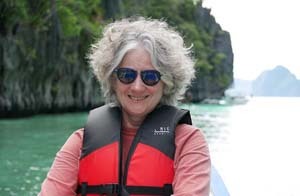 She’s followed her passion for several decades now, visiting more than 50 tropical destinations to explore reefs and natural wonders, savor the food and find what makes each island unique. The small Caribbean island of “Nevis” is one of her favorites (any island with green vervet monkeys gets our attention too). 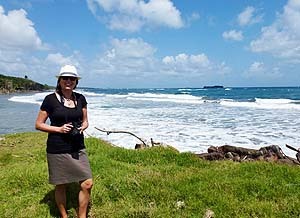 If you’re planning your next tropical vacation, be sure to check out Debbra’s posts and destination profiles on “why go?,” complete with eye-catching photos and links to her published newspaper and other travel articles. 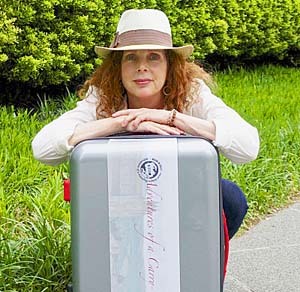 Carol Perehudoff describes herself as the “most enthusiastic luxury travel blogger around.” And her blog Wandering Carol will make you laugh – she’s a gifted writer who doesn’t take herself seriously. Again, while not specifically geared to boomers, the hot springs resorts, spas, European ski trips, art gallery visits and other luxury travel experiences she covers are ones boomers are most likely to be interested in. There’s no stuffiness or snobbery here though. Like we said, she’ll make you chuckle. This female-oriented blog is just one of Beth Whitman’s endeavors – she also heads up Wander Tours, leading small groups (women-only and co-ed) to Bhutan, New Guinea and other off-the-beaten-path destinations. On Wanderlust and Lipstick, Beth mixes it up with profiles of gutsy women around the world (from a Kenyan-born singer to a bookstore owner on Moloka’i) and tales of her own adventures (like running the Tokyo marathon). Expect to see posts on hiking Machu Pichu in the future – that’s still on her wish list. Which of your favorite bloggers are here on our list of best boomer travel blogs? Have we missed any? Enough About Coachella: Bring “Desert Trip” (Oldchella) Back! Great list – so helpful! 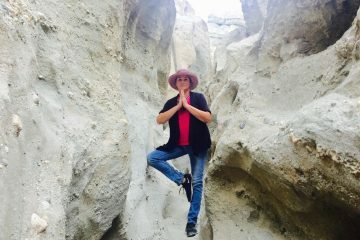 Would love to see Cindi Conley’s Traveling Later blog (https://travelinglater.com/) included on this when you update the list for 2019. I love that she unapologetically checks her bags because it make her feel thinner (ha!). I love some of these Travel blogs, five years ago I upped and went on a long trek, on and off four and a half years. Since I got back many freinds aasked me for advice on some of the places i had visited, which they wanted to visit, this led me to start writing my own blog.. interested in taking a look? . its early days yet.. but about 15 more countries and more cities to add. for the indepenent traveller.. I just learned about this list. Thank you for including me. Love these boomers! Thank you so much for sharing us this decent blog and its very informative. I follow a few on this list; gonna have to check out the ones I don’t. Truly, I feel I can live vicariously through these bloggers. Plus, great travel ideas and tips! very informative article & i got more information from your article. Thanks for sharing. Thanks for sharing this informative blog post. Really good information. Love your post. Wow, Excellent list. You share the list is very helpful for me. Thanks! Seems like a great crowd. I already follow Sweet Leisure, so I might just have to follow the other blogs too. What a nice blog.This blog is so much informative and helpful.Thanks for sharing this. Great list! I follow some of these blogs already and l am thrilled to discover more. We would love to be considered for your next update https://nextbiteoflife.com . I am 54, African American and early retired with a home base in Spain but travel often with my husband. Traveling while black is indeed the same for the most part, but not always and l try to reflect that on our travel stories. Congratulations to all on the list. Great to see so many great blogs in one list. Love that you’re promoting a demographic that’s sometimes overlooked. Wow, nice blog i love this. What a great list, really helpful and inspiring! I would be glad if you can include my blog in to your list. Thanks! We’ll take a look next time the list is updated! This is a wonderful list! I already follow many of these blogs, but you’ve introduced to a dozen I didn’t know about — thank you :-). When you re-publish or update your list, I would love to be considered. Will do, Anna. What is your blog? Great list of bloggers. I’m still new to the blogging world but I’d love to be a part of this list some day soon. Thanks for visiting and welcome to our world! We will keep you in mind next time we update this list. Great list of boomer bloggers. We are based in Panama and most of our travels are around South America. We would be honored to be included in your next list. Thanks so much for visiting and letting us know about your blog! In my ways it is good to share the travel blog. People can share there experience of traveling. This world is so colorful, spend your vacations in traveling place to place. There’s now a huge number of bloggers specializing in travel for African Americans. But they’re all millennials. Much of traveling while black is just like traveling when you’re anyone else. But, trust me, lots of experiences and interests are different when you’re African American. And traveling to Africa is the very least of it. Can you recommend any over-50 black travel bloggers? If anyone else reading this list has suggestions to add, please reply to this comment! Thanks! Fun list of Boomer Travel Bloggers you’ve compiled. Please keep What a Trip in mind should you add additional boomer bloggers. Love this post! Its great to know that there are more of us out there who love culture and travel. How about RetireEarlyandTravel.com? Thanks for visiting and introducing us to your blog! What a great list of sites! I aspire to get my travel blog up to such an elevated status. I love baby boomers supporting baby boomers. I am 53 and just started my own travel blog. These wonderful travelers have inspired me to do even more! Welcome to our “genre” and best of luck with your blog! So great to see a list of sites aimed toward boomers- sometimes we seem to get lost in the rush to court the Millenials. We know quote a few o these sites and will check out some new ones. We don’t promote our ages too much, but are managing to build an audience of fellow boomers. Our speciality is culture and cuisine from around the world. Including fantastic recipes you can make to relive your travels when you get home. Keep us in mind for future lists. All input most welcome, and please let us know how we can feature you. I know a lot of these boomer travel blogs and follow them all. It’s so great that all these people live their dream of traveling around the world at a slow pace. We did it too for five years as Grey World Nomads without a home base. Now we travel still regularly but have a little farm in Burgundy as a hub. If you’d like to read about our travels or would like to swap links to travel articles you find us on http://www.greyworldnomads.com. Wow it’s amazing to see and specially thanks to admin because you included 45 wonderful travel blog in one post. it’s really wonderful to see. and i think its really help people to find best Boomer Travel Blog. Great share! Such an amazing list of travel bloggers to follow! I appreciate you for the efforts you took for giving us a wonderful list of these bloggers. A great research you have done! Glad you found the list useful! It sure is inspiring! Thanks for this through compilation of The 45 Best Boomer Travel Blogs. Several of these names are new to us and we will be checking them out very soon. We were also happy to see several familiar favorites that inspired us originally to get on the road. With a shout out to them, we begin a year long round-the-world adventure of a lifetime in a few short weeks. Our blog journals the soul-searching and excitement we experienced preparing to un-tether from our workaday world and begin quenching our thirst for new adventures. Thanks for visiting and checking out our list. We will eagerly check out your blog and wish you the best on your next adventure! Great list. Hope we can make it next time. Wandering Rose Travels is the story of a couple retired at 60 with a goal to hike, bike, paddle and explore all we can while our joints still can. We just started a blog in June 2017 but it’s off to a great start. Our goals are to inspire baby boomers to get out there and be active on vacation and to support non-profits that protect our lands and courage people to get outdoors. What a great list! So many new names for me to look up. Glad to see you covered many types of travel. As a writer, you never know who might be touched or inspired to try something new. This is funny…or rather, odd is the word. When I first started my travel blog two years ago, I decided not to show my photo and give away my age because I thought younger readers would be more interested in, and more likely to read, a blog (I sound young on the page). The funny/odd thing is this: turns out, most of my readers now are…um…older-than-young readers. Anyway, thanks for compiling this list and letting me know just how cool older-than-young bloggers can be! And that there are so many of them. At the TBEX Ireland conference the one thing everyone advised was: “find your niche.” I think I need to switch niches. Thanks for your comment, Keith! We do have a niche of passionate travelers with more time and disposable income than many younger people! Wow ! Such a great list ! Great list, and I can’t wait to check out each site! 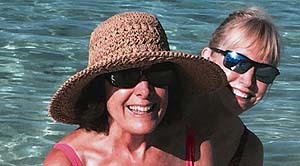 Our blog, GetawayMavens.com, is also Boomer-oriented. We focus on mostly on the Northeast USA – offbeat, luxury destinations from Virginia to Maine. Thanks for stopping by, Malerie! We’ll check it out! What a great resource! I LOVE to travel (and so do most of my readers!) so I’m looking forward to checking all these sites out. Thanks for putting them together. Thanks for visiting! Hope you find them as helpful as we do! Happy to see so many friends and bloggers I admire on this list, having met many of them through TBEX. For your consideration in future years, my blog, JourneysWithStephen.com, is for Upscale on a Budget travel, aimed primarily at the boomer demographic. Congrats again to those recognized here! Glad you see some of your TBEX friends here :-). Thanks for bringing your blog to our attention! Oz Land turns out many good travel bloggers, we’re discovering :-). Maybe it’s all the happy Vitamin D you get? Maybe we don’t make our age obvious, or maybe we just travel in a too unusual fashion. Whatever, dare2go.com is not on the list. Still, my sincere congratulations to all the colleagues who made it! Sorry to disappoint you! We are certain there are many excellent boomer travel blogs that aren’t on this list. We plan to add additional blogs later — so stay tuned :-). Social media stats like that are impressive — way to go! Of course we’ll consider other excellent blogs for the next itineration of this list :-). What an honor to be among so many other bloggers in the “boomer generation” on this list that I know and admire! I am also looking forward to becoming better acquainted with others I’ve yet to discover! I am doubly honored to be a regular Contributor to Getting on Travel and looking forward to sharing more travel experiences in 2018. Thanks Debbra! We look forward to more of your “tropical” travel stories in 2018! I truly appreciate being part of this list that includes so many others who I consider mentors. I’ll share it with my travel loving, boomer leaning demographic friends. Thanks Suzanne! BTW, you confounded us with “Zentangle” — we had to Google that :-). Wow, that’s an impressive community! Here’s to 60+ female power! We know your site — it’s a terrific resource for 60+ women :-). What a great list, and thanks for including clarknorton.com on it! Many familiar sites here and many others I can’t wait to check out! The holidays are a good time to catch up on some boomer travel blog reading :-). Thanks for including Travelnwrite. What a kaleidoscope of travel information and entertainment is represented here! I’ve enjoyed many of the blogs listed but you’ve introduced me to new writers as well – I can hardly wait to become acquainted with them. And thank you for the work that went into compiling this list! You’ve captured us perfectly! We’re happy we got it right! Thanks for letting us know :-). Any travel blog roundup that describes me as ‘gifted’ is okay by me! Thanks for including me, and for introducing me to some great new writers. Well, we do think of you as a “gifted” writer :-). And we’re not alone in that view, what with your travel writing resume that includes the New York Post, San Francisco Chronicle, Toronto Star and Chicago Tribune. 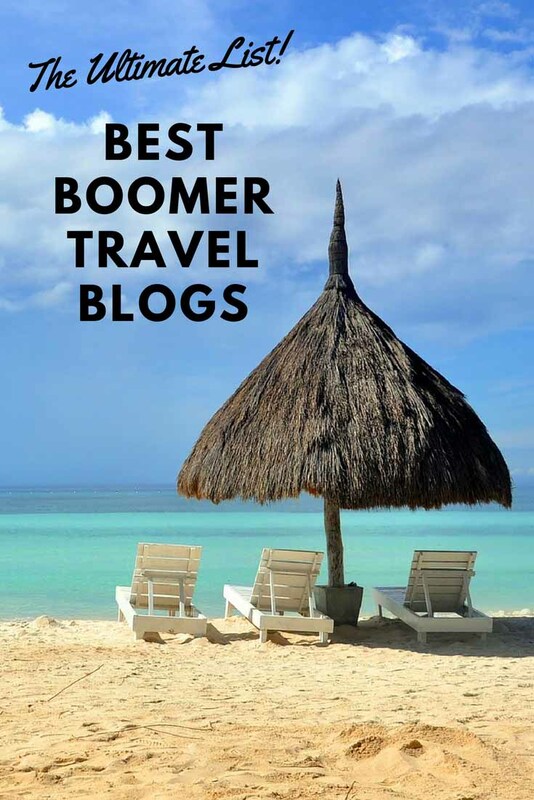 Thanks so much for including my blog in your list of top Baby Boomer travel blogs – I’m truly honored. We were happy to include your blog :-). It deserves to be recognized — not that you needed the recognition, as yours is already known as a top boomer travel blog! As a newish boomer blogger I have read this list with interest. So many talented people with such great content. Nice for me to recognise a few names too. What a treat to be included in this list of great boomer blogs! Tom and I are happy to be in such fine company and delighted to discover several new writers and photographers to follow! It’s fun to discover some new boomer travel blogs, isn’t it? We didn’t want to just regurgitate only the most well-known. 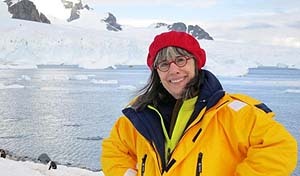 I love the fact that Journeywoman.com has been included in this juicy list of Best Boomer Travel Blogs. Thank you so much for the opportunity. I look forward to letting my readers know about the combined travel knowledge these blog posts offer. Together we are all stronger! Oh no, you two shouldn’t be depicted as little cartoon characters! The detail and depth of your posts warrants a proper portrayal of who you are :-). Such an amazing list of blogs to explore. Thx so much for including me on it. I know many on the list, but will definitely check out the ones I have not yet explored. A terrific resource for anyone who loves to travel and appreciates writing in the experiential voice. That’s partly what’s so great about all the boomer travel blogs and bloggers here. Different emphases, different perspectives, different destinations and different styles. There’s lots of talent among the boomer travel blog community, that’s for sure! Shoot us an email, so we can talk about your contributing to GOT :-). We love your boomer travel blog :-).